The Income Gap is Here - and getting bigger. The last few years in the US have certainly been economically tough for many people. Throughout the country, high unemployment rates coupled with the housing crisis exposed how vulnerable many families actually are. This issue was brought to my immediate attention today, when, during my morning perusal through the news, two articles in particular caught my attention. The first, an AP report on some of the economics of the 2010 census, is headlined "Census: 1 In 2 Americans Are Poor Or Low-Income." About 97.3 million Americans fall into a low-income category, commonly defined as those earning between 100 and 199 percent of the poverty level, based on a new supplemental measure by the Census Bureau that is designed to provide a fuller picture of poverty. Together with the 49.1 million who fall below the poverty line and are counted as poor, they number 146.4 million, or 48 percent of the U.S. population. The article credits government "safety nets" such as food stamps and some tax credits for keeping those numbers down. In other words, without the social programs that are in place (and that are continually threatened through federal and state budget cuts), it is likely that more than half of all people in the United States would be "Low-Income" or worse. Suddenly it's looking like the land of promise is no longer. No wonder migration flows from Mexico have slowed considerably. The second article that caught my eye drives home the point that these troubling economic times are not necessarily being felt equally across the population. In this Forbes piece, it is revealed that six members of the Walton family - the family that started WalMart - have more wealth than the bottom 30% of the US population combined. This is evidence that we live in times not much different from the days of serfdom in medieval Europe when the few nobility held the majority of wealth, while the majority worked in subservience. The possibility that one family could have the wealth of 75 million people would be mind boggling if it were not such an open display of greed and inequality. 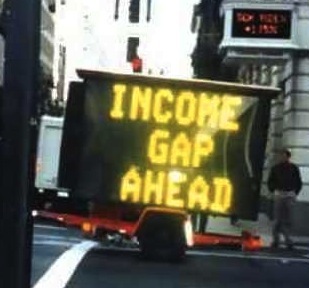 And remember, the income gap continues to widen to levels never before seen in the history of the country.